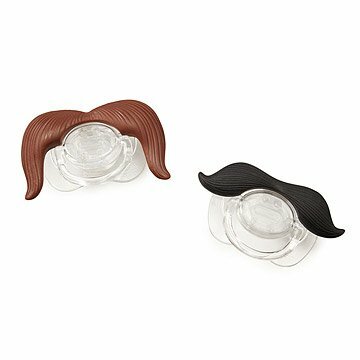 These hirsute pacifiers will quell a wail while giving new parents a much-needed chuckle. Even if the only 'stache your tiny trendster can sport is a milk moustache, this mustachioed pacifier still makes irony adorable. The quirkiest way to quell a wail while giving new parent's a much-needed chuckle. Made in China. Brown mustache is the "Cowboy", and black mustache is the "gentlemen"
Obviously this vendor sells things that this item does not apply to...please regard...! Bought for fun expectant parents. They got a kick out of it and was a nice way to great the new addition to the family! I made this purchase for a friend who had her baby prematurely. Whenever I said that I wanted to get Norman a gift, my friend said he has everything. I knew I had to find something he didn't have so I googled uncommon baby gifts and low and behold, found your website. In addition to finding the moustachifier, I also purchased the building blocks that light up. My friend said that Norman is mesmerized when they build something for him. In addition to the baby gifts, I found numerous other potential gifts for family members and other friends that I want to get. Such a neat idea you have come up with! Perfect for gift giving!! Thank you! Big hit at the baby shower! I gave this to my niece for her baby shower. It was a big hit with everyone! I bought these for my nephews and they were a huge hit! Babies always need their pacifiers, they might as well look dapper while using them. The little men looked great with their mustachifers! The hit of the baby shower! This Mustachifier was the hit of the baby shower and we're all very excited to see the day Baby uses it. This mustachifier is too precious! Every little man needs one!